The working interface of GDevelop is based around editors that are displayed in tabs. These editors allow you to change different parts of your game. The initial Start Screen is displayed when you first launch GDevelop. It is here that you create your projects, load previously saved projects, or load tutorials. At the startup, GDevelop will check for new updates. If a new update is available, the update will automatically be downloaded. You can see the progress by clicking on About GDevelop. When a project is opened, you can click on the top-left button to access to the project manager. Using the project manager, you can add new elements to your game and open editors. Learn more about the content of the project manager here. When opening a scene (or an external layout), a scene editor opens. 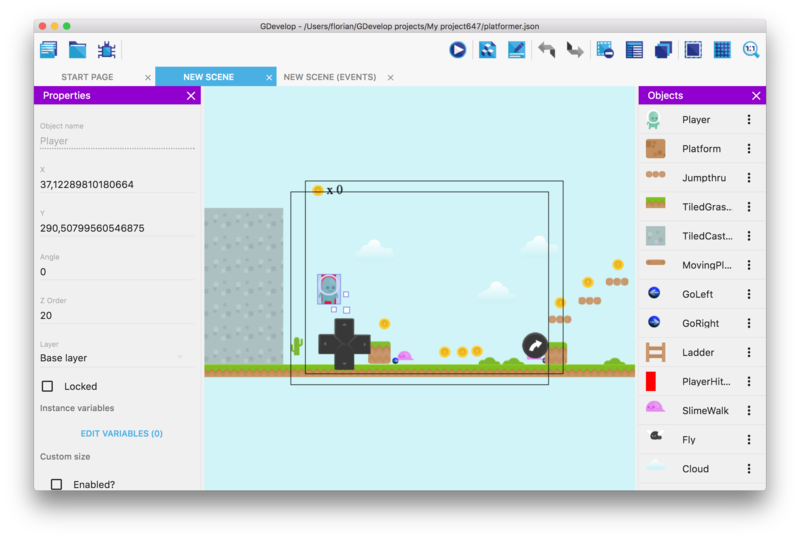 This is where you can design and build your game levels and menus by creating and adding objects to the scene. 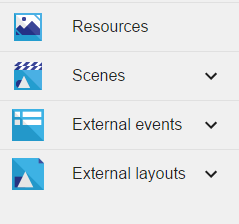 Learn more about using scene editors. When opening a scene (or when opening external events), an events editor is also opened. This is where you can use the events to create the actual gameplay and allow players to interact with your game and play it. The events editor is a tool that allow you to visually program your game without any programming knowledge or experience required so anyone with any background can make a game in GDevelop. Learn more about its usage on this page or check the help about events. The menu at the top of the screen (only on the desktop version) allow to open, save and publish a game. You can also open GDevelop preferences or see the profile associated to your GDevelop account.